Black Wooden Rosary with 5mm round beads. Handmade clasp-less chain forms a closed loop of beads with a 'closed length' of approximately 12 inches (300mm), and a total 'open length' (if loop were opened out) of 24 inches (600mm). 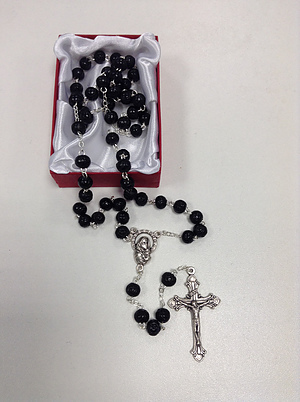 Black Wooden Rosary is published by CBC Distributors and is our 10556th best seller. The ISBN for Black Wooden Rosary is 6224BK. Be the first to review Black Wooden Rosary! Got a question? No problem! Just click here to ask us about Black Wooden Rosary.